Two city boards approved a staff-written report on May 7th that recommends closure of almost two miles worth of social trails, despite the requests of over 270 locals who asked that several of those trails remain open and grandfathered into the official trail system. A view from Kitty Charmer Trail, which is slated for closure, once its replacement has been built. The Draft Natural Surface Trails Analysis and Recommendations Report was approved by the boards with the condition that replacements to the ones slated for closure be built first. What those replacements will look like, or to what extent is yet to be decided by the City. At the start of the meeting, Parks and Recreation Director Cathy Metz told the boards and the public in attendance how the process, in theory, would include City officials, the La Plata Open Space Conservancy and the Parks and Recreation Advisory Board. The primary reason that City staff are recommending nearly two miles of trail closures, according to Metz, is because they were built illegally. “And so what we like to do is, there may be opportunities where Trails 2000 has done some analysis,” said Metz. “We may be able to reroute that particular trail, or we close it entirely, and Trails 2000 would create a nearby trail, close to where that one is being closed that would work better for the community,” said Metz. Before the Boards voted to close the trails, a large audience of mountain bike advocates asked the Boards to reconsider their discrimination against the trails and the community’s culture of trail building. 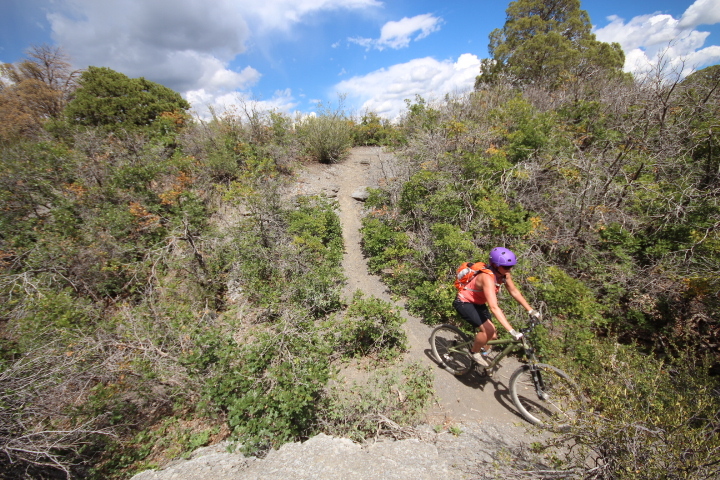 A woman rides part of Grabens Loop (slated for closure) directly above its connection with the top of Star Wars Trail in Overend Mountain Park. This mapped segment of trail was built before the land went under conservation easement, yet it still remains mapped by the City for closure. Other advocates at the meeting asked the City to avoid the wasting of resources that would go into closing them, only for them to get reopened by users, or new social trails built as replacements. 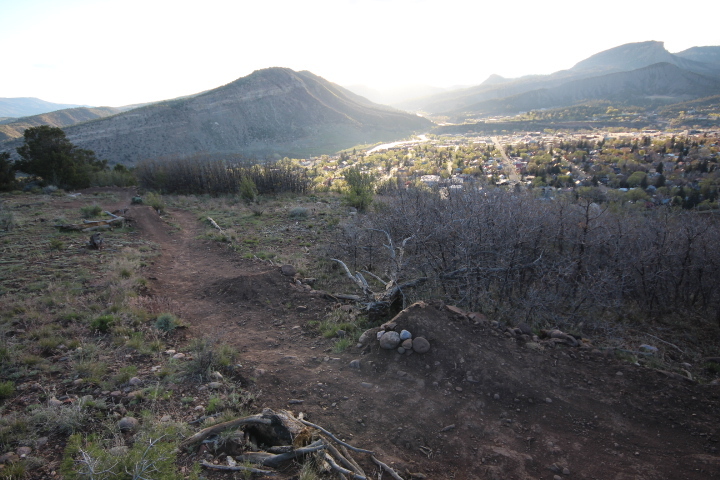 As a technique to lessen the impacts from trails or likelihood of too many trails existing in one area, mountain bike advocate Ben Bain told the Boards that land management agencies in Moab, Utah and Sedona, Arizona have shown a willingness to sanction user-built trails in some instances, which Durango could also benefit from for the same reasons. Before the City decides to close any trails, it should acknowledge that recreation is a component of the conservation easement, said Walker Thompson. Trails 2000’s Executive Director Mary Monroe Brown talked about progressive trail projects and alignments being studied for upcoming work that includes a reroute of Medicine Trail in Horse Gulch, a downhill trail at Chapman Hill, a bike park at Cundiff Park, and a progressive trail in Dalla Mountain Park that could be the City’s conditional replacement of Kitty Charmer. The alignment of the progressive trail in Dalla Mountain Park was proposed by Grady James, and has not been mapped out for the Boards to review yet, said Monroe Brown. By the end of the meeting, it was the comments of Trails 2000’s Gravity Council Chris Strouthopolous and Natural Lands Board member Ed Zink that influenced the wording of the motion that the Board’s approved to time the closing of the existing illegal trails with the opening of new, officially-sanctioned trails. “The faster we can make this, the better it’s going to be,” said Zink, after discouraging a long, drawn-out bureaucratic process that takes multiple committee meetings to authorize one trail. Thanks for updating us. Interesting that they did NOT have any mention of public comments in their analysis and recommendation report. The city needs to work WITH the public and the community and improve the relationship. Trails 2000 needs to step up. Why rebuild a trail and destroy more land “nearby”, when there is a perfectly good one. Is there a plan for restoration work to be done on those trails? It’s going to cost money and staff to restore that land. Just designate the “illegal” trail. It can work with a solid city planner and devoted local mountain bike voulnteer groups.